Is is a pity more people don't come to the matches but at least it gives me a better chance of getting on the bus home ! RR&R has taken on a ghost writer perhaps? To be fair nobody's going to start coming again until something's worth coming to see... Who's going to buy their first season ticket to watch a mid-table battle? The point I'm about to make was made many times by others on the old forum but it still doesn't seem to sink in. A very very high perctenage of people in Crawley already support a London based or higher up team. Nearly everyone I know who goes to watch Crawley already have a team. Just because Crawley got into the football league doesn't mean people in the town will automatically switch teams. I wonder sometimes if people on this forum actually know or understand the culture of football. "already have a team" but when you ask them how may times they have seen them play, all you get is muttered excuses. 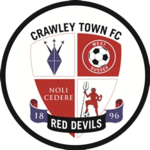 I am a great believer in supporting your local team and we all know those who decry Crawley and say they support a "proper" team, yet on Saturday afternoon they are in the pub or at home watching Gillette Soccer Saturday, pretending to be an expert and a supporter of a team they have never been to see. All the more reason for me and Sons FC Jr to watch Crawley at every opportunity. I agree with everything else that you said. Just lose the superiority complex next time. I agree that most people don't go and watch their team.....but that doesn't mean they will or should go and watch Crawley. Or even switch loyalties. And as for supporting your local team.....that is getting popular and has been for some time with younger fans as they can't afford to watch higher divisions. While accepting we are one of the smaller clubs in the league it is also to a certain extent performance dependant. We were in the 3000s for some time in league one and have spent the last three or four years struggling in the lower reaches of league two often with poor football (on occasions such as least season for a couple of months we grew crowds and interest) which is never going to grow crowds to any great extent? As soon as Accrington are back down again, maybe if Forest Green lose the sparkle of the first couple of seasons, even if Burton did come down etc etc we would have other rivals for lowest crowds. Also we are in a largely northern based league in the last couple of seasons with most if not all the bigger southern clubs gone and so away contingents must have shrunk considerably. Also if anything the home element of our attendances may have gone up a hundred or two in the last three years to around 1800 ish? Not trying to make allowances for all the sheep who go off to London or Falmer for their overpriced (and often crap) football fix but just trying to put a bit of context? Some better more consistent football, a manager not in denial about the awful fare at times, and the odd cup run could work wonders! good point about loss of over 1000 regular home fans. Unfortunately they left when the football became dire. I think what’s interesting is that Stevenage is the same distance as us from London, only been in the football league a similar amount of time yet their average attendance isn’t that much higher than us - and this is probably because they are pushing for the playoffs. They have a similar problem with fans going to watch London clubs so I don’t think we’re in a bad situation here. We have some great incentives in place such as staggered pricing and the occasional game being cheaper etc. What we need short term is Palace and Brighton to get relegated from the Premier League and another FA Cup run - 3rd or 4th round will do. There is no quick fix for this apart from the above which will affect support slightly. This is more over the next 10 years for the younger generation we will see support increase. Then if we ever get back into league one we will then have more chance to sustain that position by affording good players to stay in that league.